Heat oven to 350°F. Spray bottom and sides of 13x9-inch pan with cooking spray. In large bowl, stir Cookie Base ingredients with wooden spoon until dough forms. Press in bottom of pan. Bake 15 to 18 minutes or until golden and just set. Cool 15 minutes on cooling rack. Meanwhile, make cheesecake filling: In large bowl, beat 2 packages cream cheese with electric mixer on medium speed until smooth. Beat in granulated sugar about 1 minute or until mixture is light and fluffy. Add baking cocoa, 1 teaspoon of the espresso granules, the coffee liqueur, vanilla and eggs. Beat on low speed just until blended. Spoon and spread filling evenly over cookie base. Bake 25 to 30 minutes or until center is set. Cool 30 minutes on cooling rack, then refrigerate 30 minutes to cool completely. To make cream cheese topping: In medium bowl, beat 1 package cream cheese with electric mixer on medium speed until smooth. Beat in powdered sugar about 30 seconds or until mixture is light and fluffy. Add whipping cream and vanilla vodka; beat on high speed 2 minutes. Spoon and spread topping evenly over cheesecake filling. Refrigerate 2 hours to chill. Just before serving, sprinkle remaining 1 teaspoon espresso granules on top of bars. Cut into 9 rows by 4 rows. Store covered in refrigerator. For a smooth topping, use an offset spatula to spread cream cheese topping on bars. 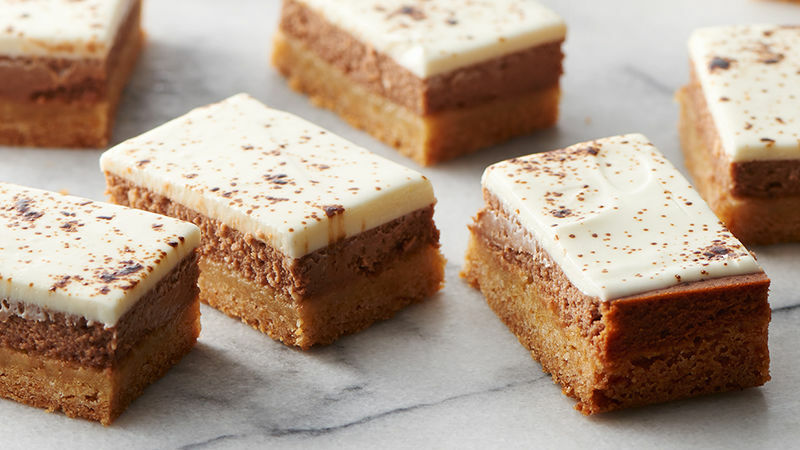 Use a sharp, clean knife to easily cut cheesecake into bars.